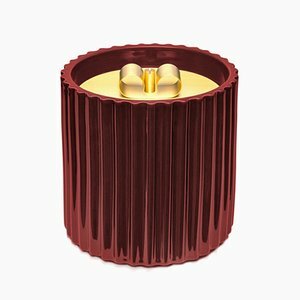 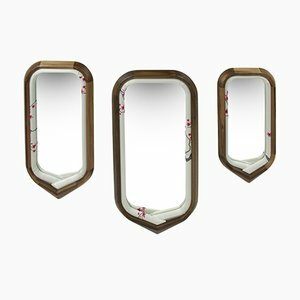 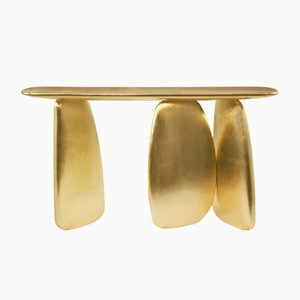 At first glance, jewelry and furniture design seem to have almost nothing in common: the proportions; the materials; the forms—across all categories the divergence is marked. 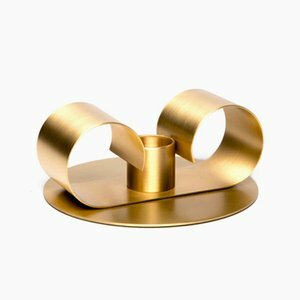 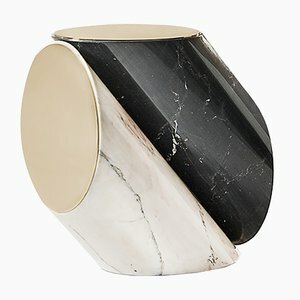 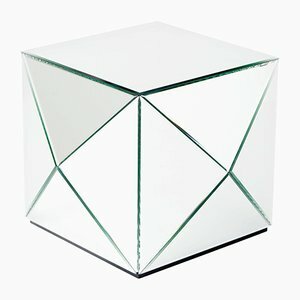 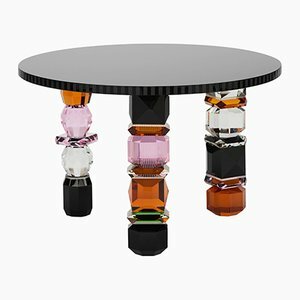 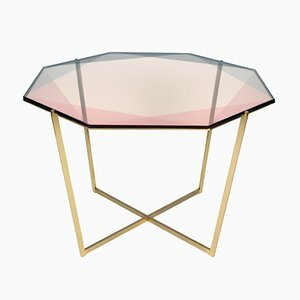 And yet we are seeing not only more and more multitalented designers who are moving freely between the worlds of furniture and wearable design, but also a shift towards furniture that draws inspiration from jewelry. 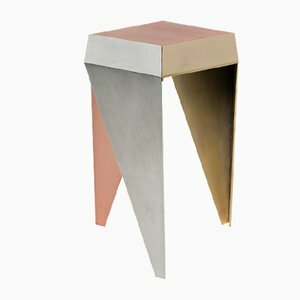 From the metallic, facetted construction of the Rayuela 3 (2017) Stools by Alvaro Catalán de Ocón for ACdO/ to the blown-up gems of Covet Paris’s Diamond Pyrite and Diamond Emerald Sideboards, it’s clear the trend is gaining momentum across a variety of expressions. 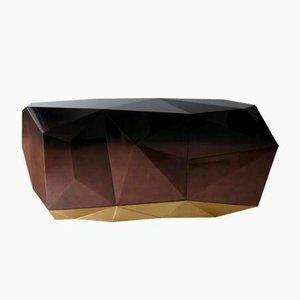 Surveying the design landscape at the intersection of wearable and furniture design, some designers go for literal bling—like the exquisite detailing of Helena and Carlos Costa’s Enxoval Cabinet (2016) for Alma de Luce , which glistens with over 30,000 Swarovski crystals. 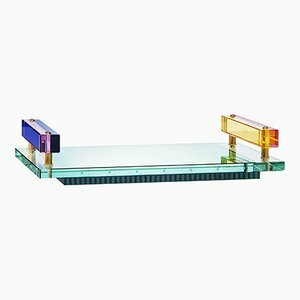 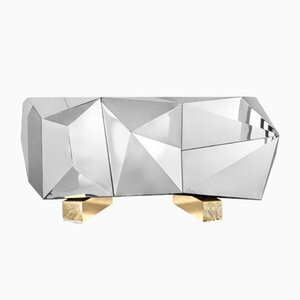 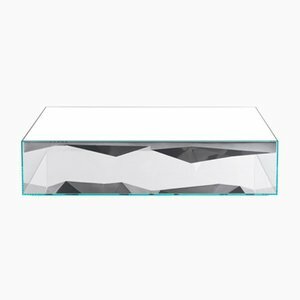 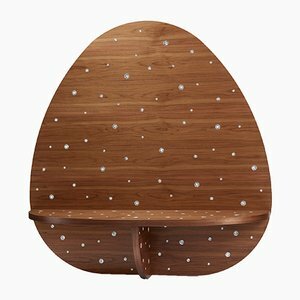 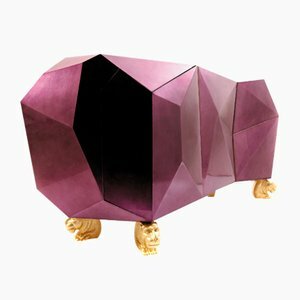 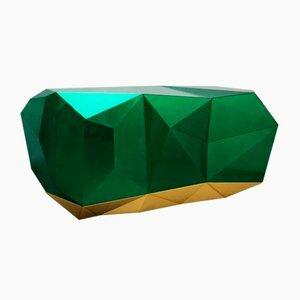 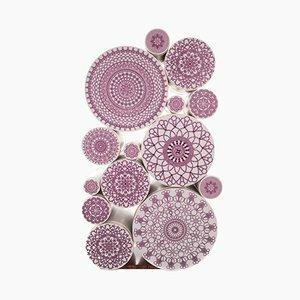 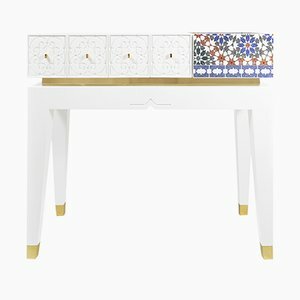 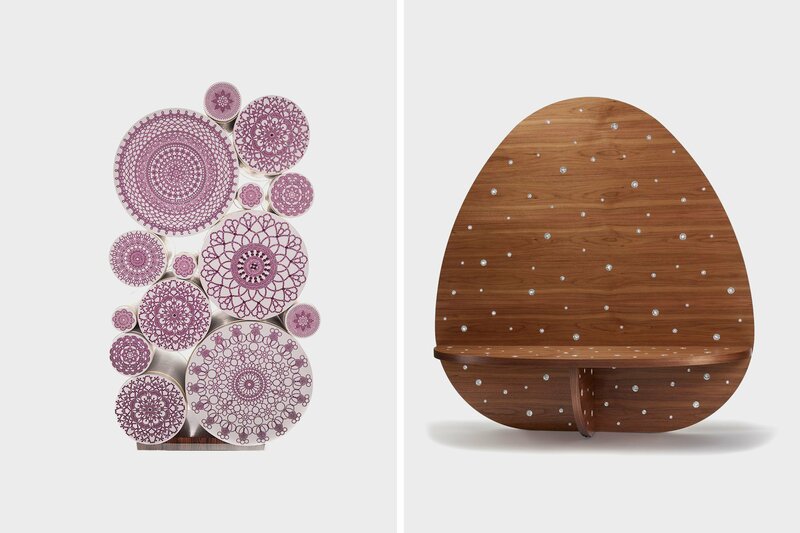 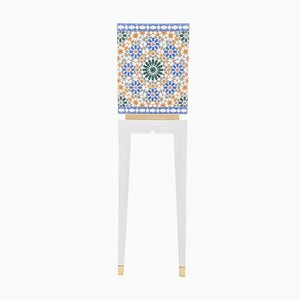 Or take the Carats Mural Bench (2017) by Swiss design mainstay Philippe Cramer, also inlaid with facetted crystals. 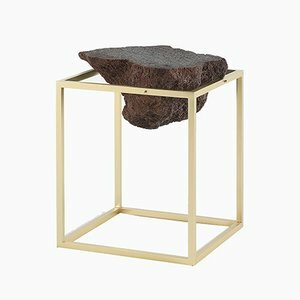 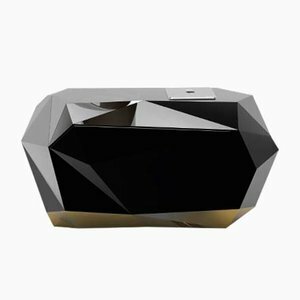 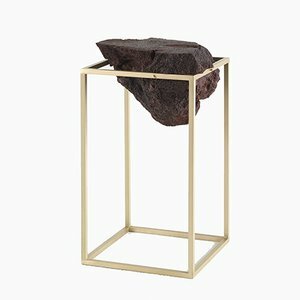 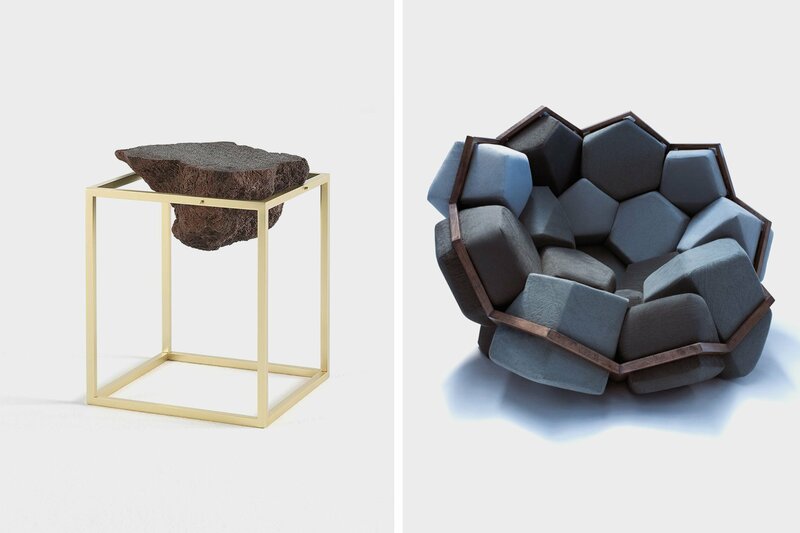 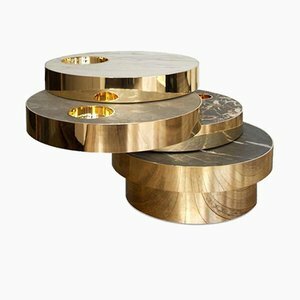 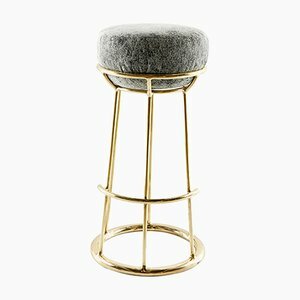 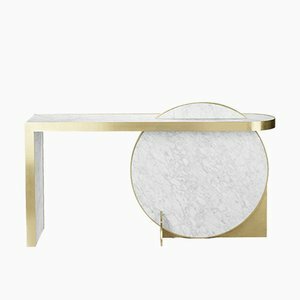 Meanwhile conceptually-driven brands like CTRLZAK have riffed off the gem-like interiors trend in unexpected ways: the Antivol Table (2017) presents a chunk of rough, volcanic rock in a brass frame like a minimalist diamond setting. 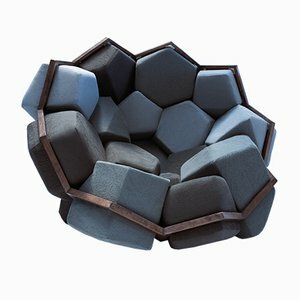 The Quartz Armchair (2013)—a collaboration with Davide Barzaghi for D3CO —transforms a crystalline shape into soft textile components. 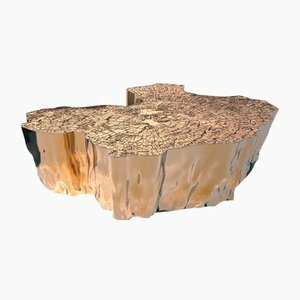 Young designers are embracing their creative freedom to explore interdisciplinary projects and pursue careers that are often far broader than their 20th-century counterparts. 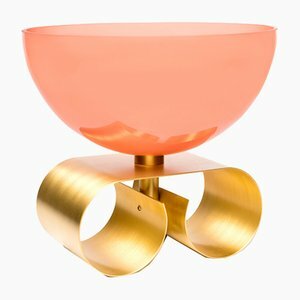 Slovenian designer Lara Bohinc is one such all-rounder; her eponymous London-based studio produces exquisite tableware, a line of jewelry dominated by graphic shapes, as well as jewelry-like furniture and lighting out. 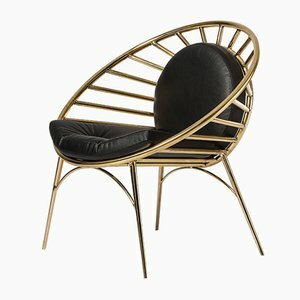 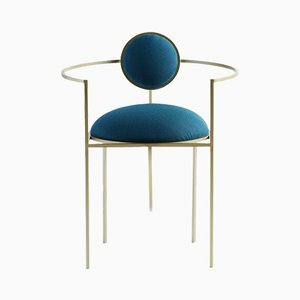 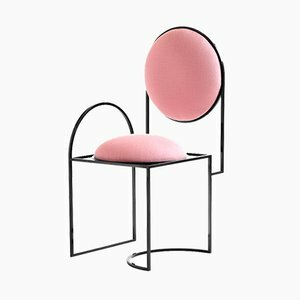 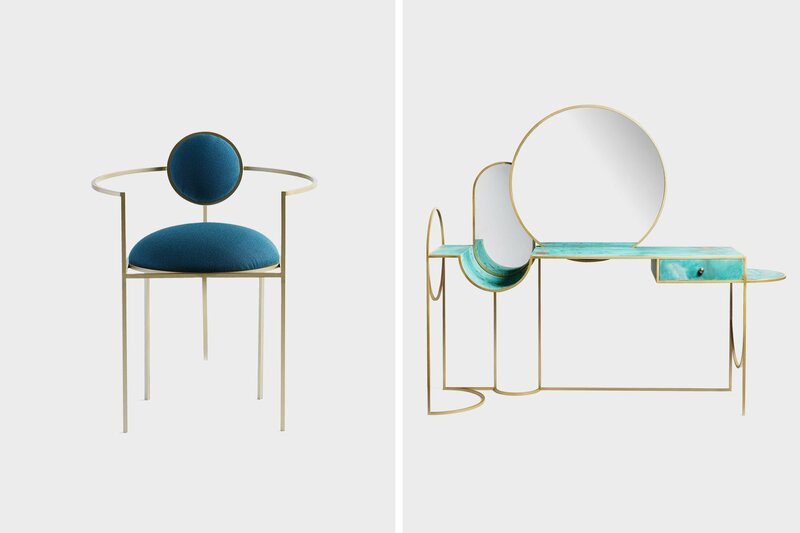 Bohinc’s chairs, particularly the Lunar Chair, are reminiscent of deconstructed curves from her bracelet, earring, and necklace designs. 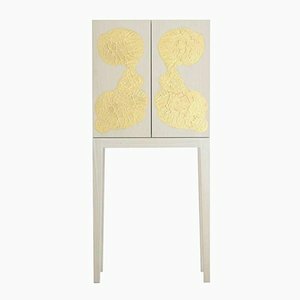 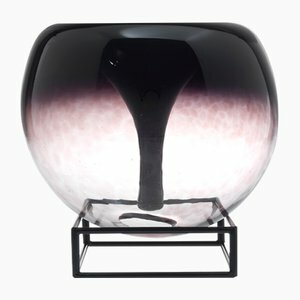 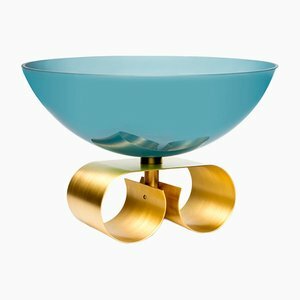 A piece like her stunning Celeste Console effortlessly embodies a contemporary Art Deco vibe that oozes glamor. We’ve written before about the recent revival of Art Deco materials and aesthetics—add to this a dash of postmodernist appropriation of form and it’s suddenly not such a jump to see where visionary designers like Cristina Celestino draw their inspiration. Celestino’s surreal Alice Lamp (2018) for Italian marble brand Budri or her The Happy Room Coffee Tables for Fendi play with literal jewelry forms blown up to furniture proportions and rendered in lavish materials like brass, marble, and onyx. 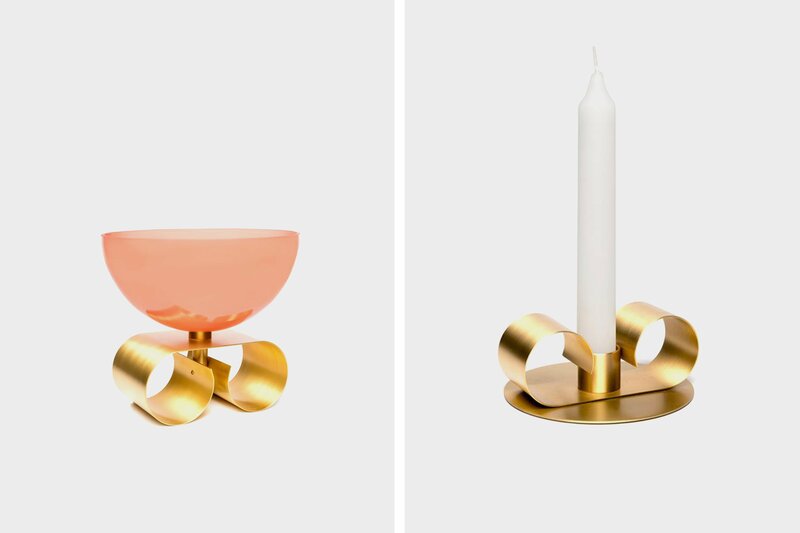 There’s even a tableware range that plays with the same themes; we’re obsessed with the Small Tramonto Candle Holder and the Small Parure I Glass Bowl. 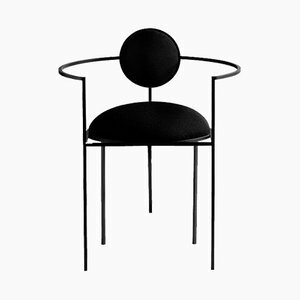 LaLouL—the studio of Belgian designer Corinne van Havre—is another example. 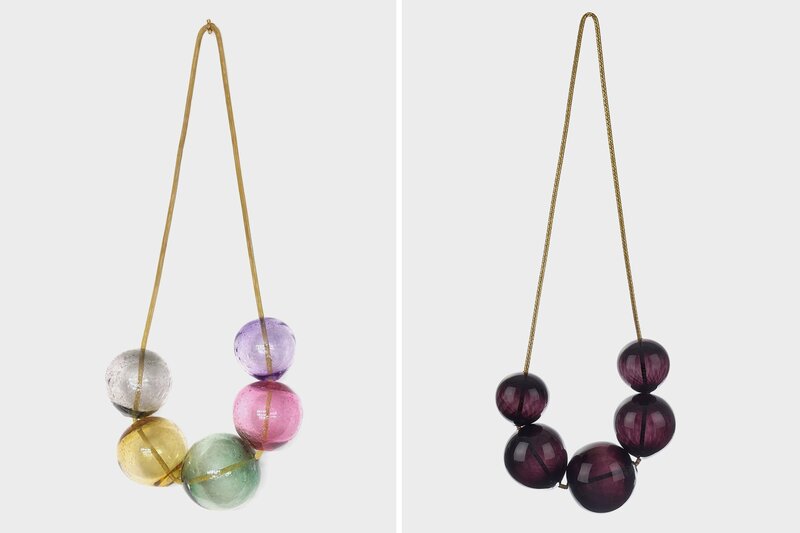 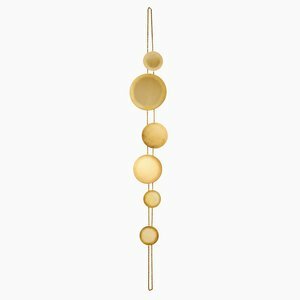 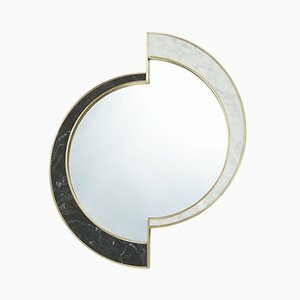 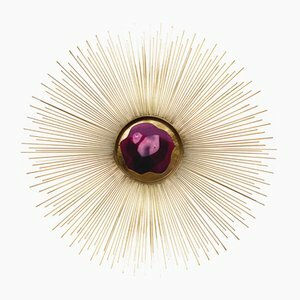 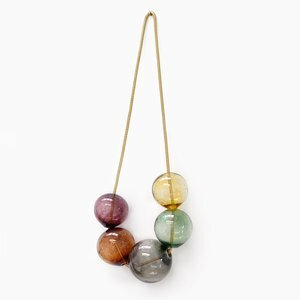 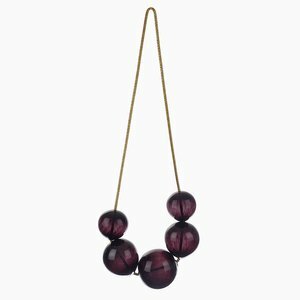 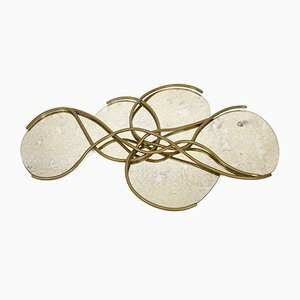 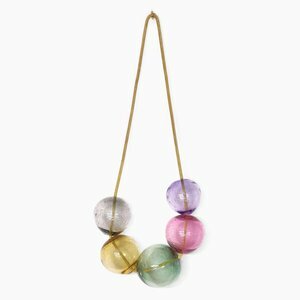 The Bubbles series of necklace-shaped wall ornaments could have been pure postmodernism in gaudier colors and less artisanal materials—instead, these mouth-blown glass and brass chain creations ooze the whimsical charm and luxurious sheen of today’s absolutely au courant jewelry-interiors trend. 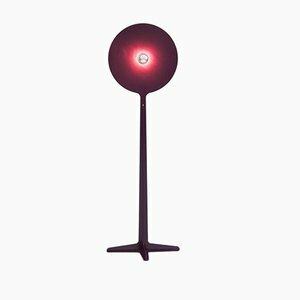 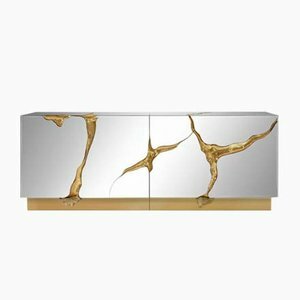 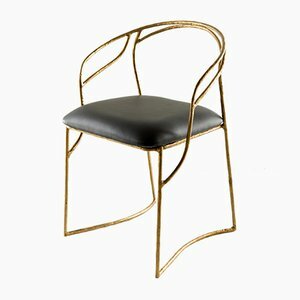 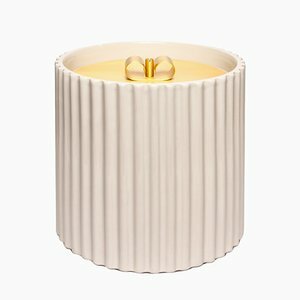 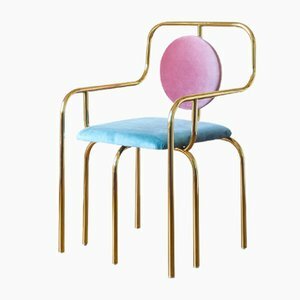 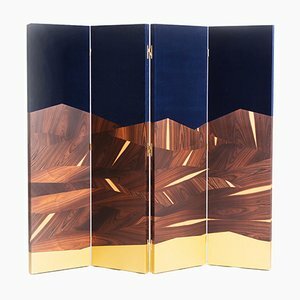 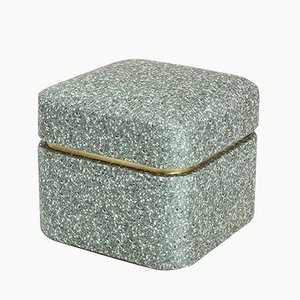 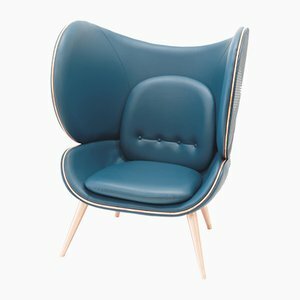 With the exaggerated beauty, glam materials, and clever references to design history, we can certainly see why this trend is proving popular amongst both designers and collectors. 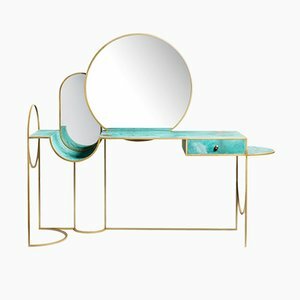 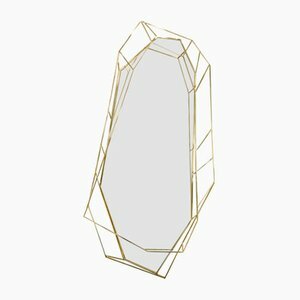 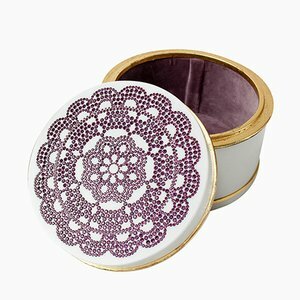 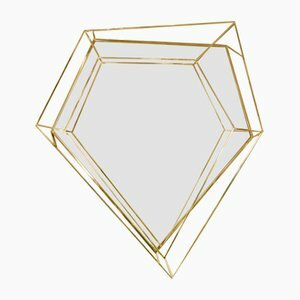 Take it from us, you can expect to see a lot more jewelry-inspired furnishings and interior accessories around for the foreseeable future.